Happy Scrappy and 2014! On to 2015! I hope all had a great New Year and that the year is starting off in a positive manner for everyone. Mine still has a few hiccups but things have settled down for us a little bit. I look back at the year and realize that I did not produce as much as I have in the past with my quilting. I do not know if it is age, Darryl’s illness, the stress of losing him, the extreme dampness this winter, or if I have really done something to my back to cause me so many problems with my Fibromylagia and Sciatica – whichever it is – I am not a happy camper when it comes to physical slow downs. I definitely am not going into my 70s gracefully! My mind says I can but the body is balking! We will see who wins! LOL But life does get in the way sometimes and we must remain as positive as we can and move forward. –I did make 2 quilt tops for the San Antonio Show this year and they are ready to be quilted. One of the tops was from Pat Sloan’s Globetrotting. –I started on the Austen Family quilt, but had issues with time and interruptions and problems with reducing the block size to 6 inch blocks. –Threads of Memory is almost completed with only 2 blocks to finish and then I can decide on a setting for the quilt. –I still have one more block to finish on Wanda’s Antebellum Ladies Quilt and only one (1) bird to finish on Block Number 1 of The Lost Boy Quilt! –Rosemary Young’s Happy Scrappy BOM was to be a challenge quilt and for me to work on my desire to develop quilt designing skills. This project has taken me longer than I thought it would. –I finished one wall hanging for the Baltimore Applique Society On-Line Auction and that was very satisfying to be a part of the fund raiser for BAS. — Sentimental Scraps – that one needs to be finished – almost forgot about Edyta Sitar project. ++On the negative side of positive – I did not get the bindings done from left over “ready to be finished” quilts from 2013. Maybe I will get in the mood soon to get those done. This year I made a decision that before I would start any major new project that I would try to finish the projects that are begging to be completed from 2014, BUT I now find out that decisions and plans sometimes need to be changed! Here I am already changing that decision on not starting a new project! The Austin, Texas Guild has a Dear Jane Bee and I joined it. We do 4 blocks a month (hum… wonder if I will be able to maintain this challenge) The Bee will meet in Austin quarterly on a Saturday for a sew in and I am so looking forward to this. Today I downloaded the 4 blocks for the month (will see where I am in February – they are “due” to be completed (if possible) by the 19th of February – this will be interesting. I have the book, rulers, and the EQ Dear Jane. I am thinking that I am going to hand piece each block. I printed out the templates on the 8 1/2 x 11 sheets of freezer paper and this will cut down some of the time in preparation work. Next decision on this project will be the fabrics. I miss working with my batiks, but think that might be a bit challenging for hand piecing and take away from the original time frame of the quilt. I sincerely hope that I will be able to complete this project as I had purchased everything (less fabric) for a Dear Jane in 2009!!!! Where has time gone? The other project is Ester’s Oma’s Blue Quilt. What a beautiful quilt in Blue. I am thinking that this one would be beautiful in my Batiks and either in Blues, Reds, or Purples. Decisions Decisions Decisions! I will probably shoot for a March start date on this one if life permits. — Oh yes – and then there is Di Ford’s 2014 Quiltmania Mystery Quilt………….yup still in the drawer along with a lot of my money that I spent on Dutch Chintz fabric. WOW – where have I been? So here we are and I am so happy because I have completed the top and bottom “block rows” of my Happy Scrappy quilt. I am pleased with it so far. Next I will begin to design the side panels from there – who knows. 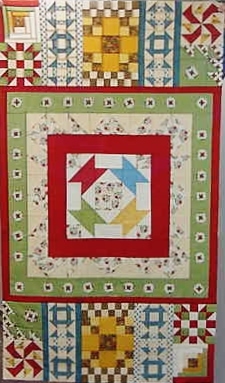 Here is a picture of my Lost Boy Quilt (also Civil War Bride) Block 1. – One little brown bird to finish! I am using Batiks for this quilt. I miss working with them, especially when I am working on an applique project! I am grateful to have completed the projects that I did and the one’s that I am trying to finish. Life is good to Clay and I even with the impending heartache that is coming sooner than later. I just hope that we can make it through the rough times. Quilting has really saved my sanity many times over. I have missed working on special projects for my Show Quilts, but if God allows it, there is next year. Have a blessed day and enjoy all that you can. I am thinking that next winter Sierra Vista, AZ would be a good place to be. This entry was posted in Uncategorized and tagged Austen Family Quilt, Baltimore Applique Society, Barbara Brackman, Di Ford, Happy Scrappy, Sentimental Scraps, Sylvester's Bean Pot, Threads of Memory. Bookmark the permalink. Oh yes… quilting has saved my sanity many times over! 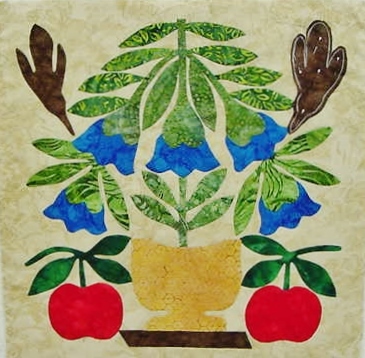 Enjoyed seeing your applique block… enjoy stitching today! Your applique is beautiful. Enjoy your stitching. I hope the little one is feeling better. Please ignore the end of this post. I inadvertently pasted a phrase. I hope you are dealing with the Fibromyalgia and Sciatica as best as possible. Fibro I can handle – Sciatica I had been handling, now it is handling me LOL. Have a great day.